The trio releases this week. Nike‘s React Element 87 “Thunder Blue/Total Orange” is the third colorway to join the premium model’s upcoming release, which includes the previously-seen “South Beach” and “Blue Chill/Solar Red” editions. The brightest among the pack, this colorway features a “Wolf Grey” translucent upper with hits of “Total Orange” at the toe area, heel pull tab and React Element sole unit. The sharp color palette is completed with black at the Swoosh branding and heel area, and “Thunder Blue” at the suede lace panels and heel accent. 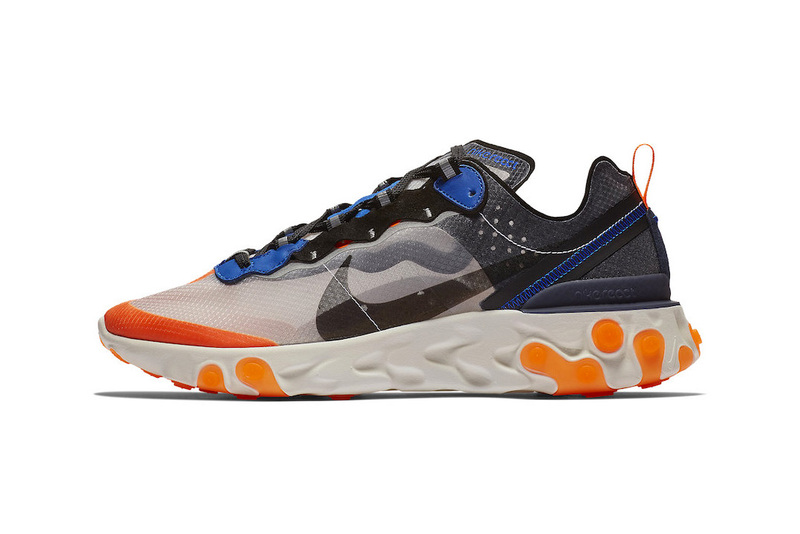 The Nike React Element 87 “Thunder Blue/Total Orange” will release (alongside “South Beach” and “Blue Chill/Solar Red”) on October 11 for $160 USD at Nike’s webstore and select retailers such as Feature Sneaker Boutique. Check out Miley Cyrus flip the bird after reading her tweet. A division specifically made for collabs. It took 6 years and $31 million USD to develop.